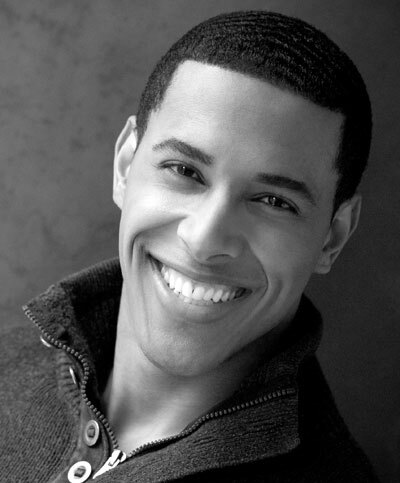 Now's our chance to check in with Donovan Singletary, who plays Jake (fisherman and Captain of The Seagull) in Porgy and Bess, and who will stay with us through the fall to sing Zuniga in our upcoming production of Carmen. Donovan tells us about the prizes and threats that pushed him into opera in the first place, about working on Seattle Opera's production of Iphigénie en Tauride at the Met, and about singing Jake as a bass-baritone. Welcome to Seattle! Can you tell us a little about your background—like where you’re from and how you got started in opera? Thank you for the welcome! I’m very excited to be here in the Emerald City. I am from Crestview, Florida, and growing up, I was in choirs and doing talent shows while playing tennis, football, track and field, and weight lifting. I was also a part of a hip-hop dance team for a while, and I was a competitive public speaker, even once making it to the nationals of an oratory competition. I’ve been singing opera for a little over 5 years now. I originally started out as a pop singer, and was involved in pop music groups before I went to college at Stetson University in Deland, Florida. I was a vocal performance major and went to college to get better training as a pop singer. Of course, I arrived at school and the world opened up and I realized how naïve I was about certain aspects of the music business. So, I tried to change my degree but I was stopped by the choral director, who had a talk with me about pursuing opera. I stayed in music a little longer, and then tried to change my degree again--but this time my voice teacher talked me out of it. So my voice teacher, Dr. Craig Maddox, and my choral director, Dr. Duncan Couch, really believed in and supported me. I still wasn’t sold on this opera thing, and my voice teacher was aware of this. My teacher was the governor of the National Association of Teachers of Singing southeast region and he told me if I didn’t enter the NATS’ Regional Auditions, I wouldn’t get an ‘A’ for his voice course. So I entered and I won. That sparked my interest in opera, and I started entering more vocal competitions and continued winning. I decided to try the Metropolitan Opera National Council Competition. At this time, I had no idea what I was getting myself into; I really had just learned about the Met. So I entered the competition at 21 years old and I ended up being one of the national Grand Prize Winners. That year, Joseph Volpe, then the general director of the Met, was about to give his post to Peter Gelb, and after I sang he came up to me and said, this year I’m giving an award in my name to one singer and I’d like you to have it. So that’s how it all started! I went back to Stetson to finish my degree, and then the Met moved me to New York two weeks after I graduated. I became a member of the Metropolitan Opera Young Artist Program and just graduated from the program last July. Angel Blue (Clara) and Donovan Singletary (Jake) in Seattle Opera's production of Porgy and Bess. 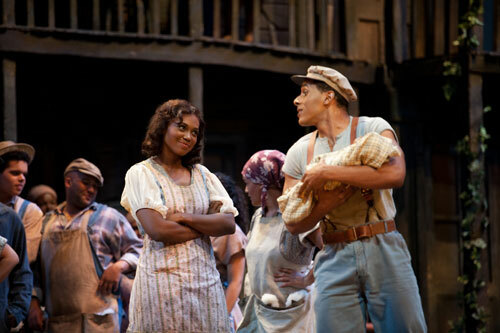 Have you had any previous experience with Porgy and Bess? When I was in university, we did a semi-staged concert version of the popular arias from Porgy and Bess and I sang Porgy’s arias. So that’s the extent of my experience with this great show! 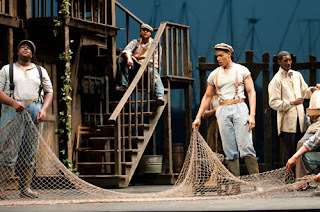 I’m really excited and grateful for the chance to have the entire Porgy and Bess experience now in Seattle. Tell us about your experience at the Met this past year. Did you get to work with Seattle Opera’s good friend Stephen Wadsworth? Last year was my first year out of the Met program, and it was great! I was involved in five operas last year at the Met, and that’s awesome for someone who has just finished a Young Artist program. I was a part of Don Carlo, Pelléas and Mélisande, The Bartered Bride, Iphigénie en Tauride, and Capriccio. And yes, I had the opportunity to work with Stephen Wadsworth! I love Stephen! I did Iphigénie en Tauride and The Bartered Bride with him! But I worked with Stephen before that because he was my acting teacher during my time in the Met Young Artists Program. Stephen has a great technique when it comes to acting. The things I learned from him have been some of the most valuable tools I’ve received during my time at the Met. His natural approach to directing, acting, and singing is amazing. And his process for developing and growing your character has been beneficial to my progress as an artist. I look forward to the next time we get to work together! You’re a bass-baritone with a wide-ranging repertory. What kind of music do you prefer singing—bass or baritone? Old-fashioned or contemporary? Opera or concert? It’s true, we bass-baritones have a broad range of repertoire! A bass-baritone should have the resonant low notes of a bass and the vocal brilliance and ability to sustain the high tessitura of certain baritone roles. I prefer singing repertoire that sits in the middle of my voice but has moments that take me to vocal extremes: Mozart roles like Don Giovanni, Figaro, and Guglielmo. Currently, Giuseppe Verdi is my favorite opera composer, but I love the music of Rossini and Handel because it gives me the chance to perform coloratura and move my voice. I haven’t had much performing experience with modern and contemporary music; I’ve sung music from Carlisle Floyd’s Susannah and hope to sing the role of Olin Blitch one day. Opera is normally big and exciting while concerts and recitals can be small and intimate. I enjoy them both. John-Christopher Adams (Nelson) and Donovan Singletary (Jake) in Seattle Opera's production of Porgy and Bess. Tell us about the vocal challenges of your role here in Porgy. Well, Jake is a baritone role and for me, generally, the higher the role is, the more dramatic the singing. I’m not thinking, ‘Oh, I have to think like a baritone’; I sing with the voice I have and let my voice adapt to the role’s demands. I’ve been learning to scale back the volume: I’m used to singing full out more often than not. So as Jake I’m trying to find moments where I can do special things with my voice and with the words to make Jake a multi-dimensional person. Also, singing the James Island Gullah dialect was initially a challenge; I approached it like I would any other language. Jake also has small vocal lines that seem to come out of nowhere, so you have to be very aware of the other musicians and the conductor. The music of Porgy and Bess is amazing! There are so many singable and memorable songs, it’s no surprise the music is so popular, or that so many great artists have performed and recorded their own renditions. The first performance that comes to my mind of a non-operatic singer’s cover of a Porgy and Bess song is: American Idol Season 3 winner Fantasia Barrino’s performance of "Summertime." Fantasia’s performance was absolutely stunning and magical. It changed the course of the American Idol competition for her. I’m grateful that Ira Gershwin, George Gershwin, and DuBose Heyward created and produced this great work of American musical literature. I’m fortunate to be a part of it currently, and give my thanks to Seattle Opera for the opportunity! Thanks for all the interestng info you shared! "wife" Clara's singing of "Summertime" and everything else as much as yuo liked the other Clara!! I look forward to seeing and hearing you tonite at the Premiere!! Toi, toi, toi to you and your coleagues!! !